President Barack Obama may become the first president since Herbert Hoover not to serve during a year in which the growth in real GDP was at least 3 percent. The Bureau of Economic Analysis has calculated the annual Gross Domestic Product going back to 1929 and annual growth in real GDP since 1930. In the 86 years from 1930 through 2015 for which BEA has calculated the annual growth in real GDP, the United States has seen 14 presidents serve in the White House. Of the 13 who served during those years and have completed their service, Hoover is the only who did not see a year in which growth in real GDP was 3.0 percent or better. President Obama—who was inaugurated in January 2009 and will leave office in January 2017—has not yet seen a year in which real GDP grew by as much as 3.0 percent. In the first quarter of this year, according to the BEA, real GDP grew at an annual rate of 0.8 percent. In the second quarter, according to the BEA’s estimate, it grew at an annual rate of 1.2 percent. Hoover was inaugurated in March 1929. As president during the first years of the Great Depression—and during the first three years for which BEA has calculated the annual percent change in real GDP (1930-32)—Hoover saw a shrinking economy. In 1930, according to BEA, real GDP declined by 8.5 percent; in 1931, by 6.4 percent; and, in 1932, by 12.9 percent. Franklin Roosevelt was elected in 1932 and inaugurated in March 1933. 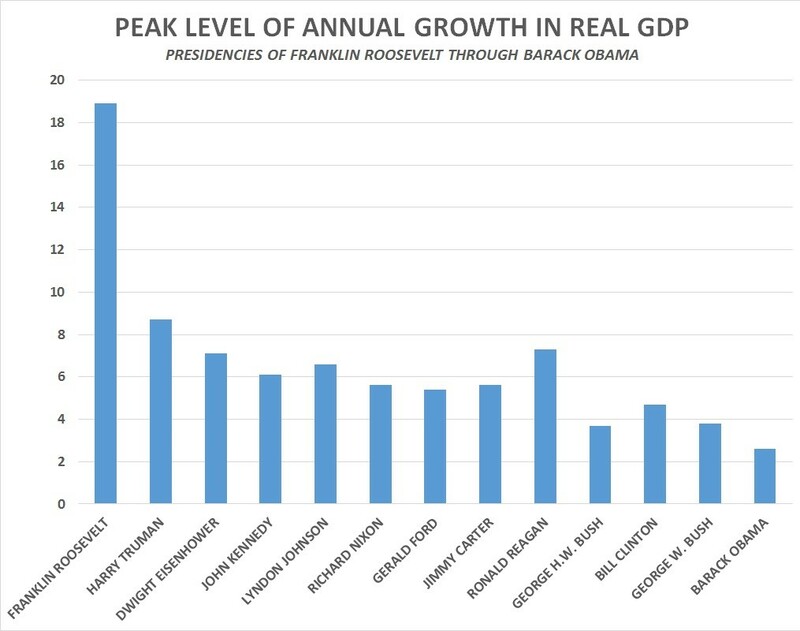 Annual growth in real GDP peaked during his time in office at 18.9 percent in 1942--during World War II. Harry Truman took office in April 1945, when Roosevelt died, was elected to the presidency in 1948 and served until Eisenhower was inaugurated in January 1953. In Truman’s time in office, annual growth in real GDP peaked at 8.7 percent in 1950. During Eisenhower’s presidency which ran until January 1961, when John Kennedy was inaugurated, annual growth in real GDP peaked at 7.1 percent in 1955. During Kennedy’s presidency, annual growth in real GDP peaked at 6.1 percent in 1962. Lyndon Johnson became president in November 1963 when Kennedy was assassinated, was elected in 1964 and left office in January 1969. During Johnson’s time in office, annual growth in real GDP peaked at 6.6 percent in 1966. Nixon was inaugurated in January 1969 and served until August 1974, when he resigned. During Nixon’s time in office, annual growth in real GDP peaked at 5.6 percent in 1973. Gerald Ford became president in August 1974, when Nixon resigned, and served until January 1977, when Jimmy Carter was inaugurated. During Ford’s time in office, annual growth in real GDP peaked at 5.4 percent in 1976. Jimmy Carter served until January 1981, when Ronald Reagan was inaugurated. During Carter’s time in office, annual growth in real GDP peaked at 5.6 percent in 1978. Reagan served until January 1989, when George H.W. Bush was inaugurated. During Reagan’s time in office, annual growth in real GDP peaked at 7.3 percent in 1984. George H.W. Bush served until January 1993, when Bill Clinton was inaugurated. During George H.W. Bush’s time in office, annual growth in real GDP peaked at 3.7 percent in 1989 (and also hit 3.6 percent in 1992). Clinton served until January 2001, when George W. Bush was inaugurated. During Clinton’s time in office, annual growth in real GDP peaked at 4.7 percent in 1999. George W. Bush served until January 2009, when Barack Obama was inaugurated. 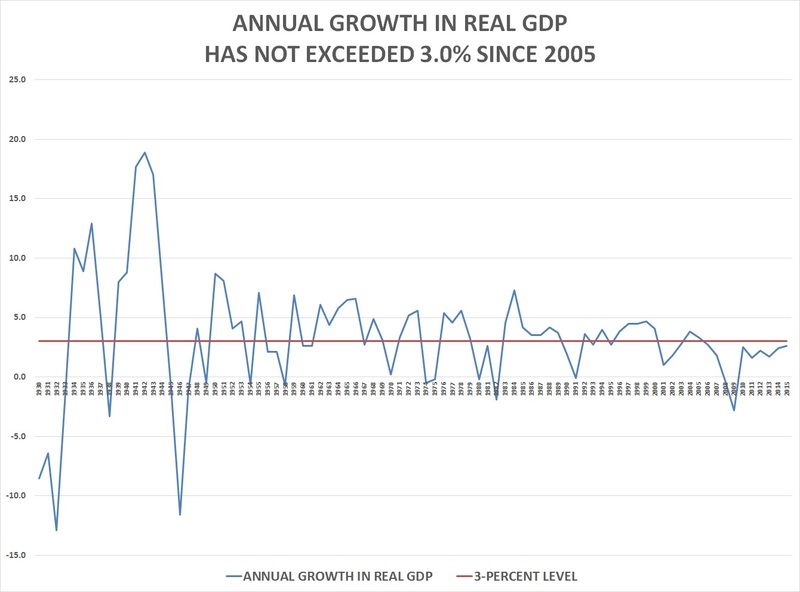 During George W. Bush’s time in office, annual growth in real GDP peaked at 3.8 percent in 2004.